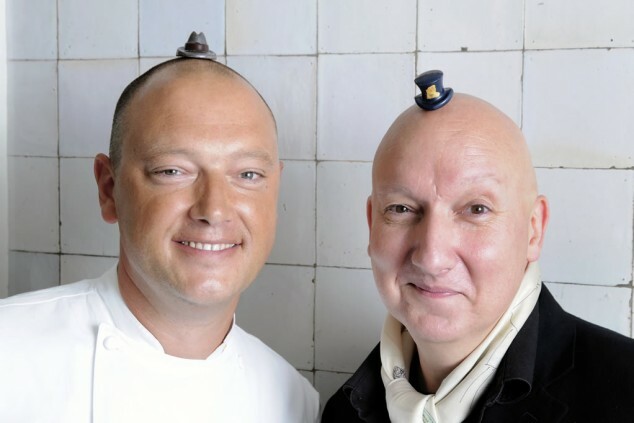 In collaboration with Stephen Jones and the Fashion Museum, Belgian chocolatier Dominique Persoone developed four chocolate truffles in the form of tiny hats from Stephen Jones’ collection. Take delight in this exceptional merging of form and taste! This top hat of dark blue artificial straw is decorated on the back with three photographic panels of passport pages.The design for this hat was inspired by the film adaptation of Jules Verne’s novel ‘Around the World in Eighty Days’, in which the protagonist, Phileas Fogg, begins his voyage around the globe form a phone box in London. Dominique Persoone presents: A bitter chocolate ganache with peat whisky and a soft milk chocolate ganache of hunter’s herbal tea. Soho, a classic trilby made of shiny vacuum-formed polyethylene, is a true classic in Stephen Jones’s oeuvre. Jones believes it is an exceptionally pure form that came about from trying to reduce the hat to its essence, to just the initial sketch. Dominique Persoone presents: A caramel of rice vinegar and soy sauce, an almond and sesame praliné with crackling sugar and "Sancho" pepper. Damn That Feels Good! is an asymmetrical hat decorated with an archshaped structure of jumbled wood and twigs. The cap to which the structure is attached, is made from hatter’s plush, a silk material traditionally used by hat makers for bowler hats. The hat’s name is a play on words since the hat’s shape is reminiscent of a beaver dam. Dominique Persoone presents: A white chocolate mousse flavoured with spring grass juice, rolled in roasted almond bars. Ecstasy is inspired by ‘The Red Shoes’, a 1984 British dance film by Michael Powell and Emeric Pressburger, and introduces a young ballerina – played by the famous redheaded dancer Moira Shearer. Ecstasy, a tiara with a bow, is adorned with a photograph of Shearer’s penetrating expression when her impressario tells her character that he will make her a star. Dominique Persoone presents: A crunchy hazelnut praliné flavoured with purple violets. The collection chocolates by Dominique Persoone, Shock-O-Latier for Stephen Jones Millinery will be sold in a specially designed hatbox for €20,00 at The Chocolate Line Bruges & Antwerp and at the reception of the MoMu Fashion Museum Antwerp. This entry was written by David Flamée, posted on October 26, 2010 at 11:04, filed under Press&PR and tagged Dominique Persoone, Stephen Jones, The Chocolate Line. Bookmark the permalink. Follow any comments here with the RSS feed for this post. Post a comment or leave a trackback: Trackback URL.